Legionella is a bacterium that is common in many different environments. The genus contains many different species and serogroups. Members of the genus are capable of causing Legionnaires disease and a milder form of the disease, Pontiac Fever. The species are capable of growth over a wide temperature range (20 to 60 degrees) with ideal temperature range for growth being 25 to 40 degrees. 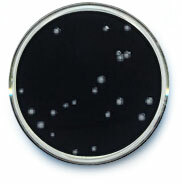 Legionella are not capable of manufacturing their own cysteine and as such grow in the presence of other organisms and are often found within biofilms. It is therefore important to reduce the presence of all organisms and biofilms when attempting to control Legionella spp. The organism is isolated in the laboratory by concentration (e.g. centrifugation or filtration) followed by culture on selective agar containing cysteine. The genus can take up to ten days to grow which is why our Legionella reports take this period of time to issue. When positives are identified they are reported to the client straight away along with a count however it should be noted that by the end of the incubation period the count may have increased. If you are an existing client and would like further technical data on this species please contact the lab for instructions on how to access and a passcode which is required to obtain this information.